When I was younger, jewelry was always an afterthought—something you threw on right before you walked out the door as the finishing touch to an already well-thought-out look. But with age comes wisdom, and I've realized that jewelry should not only be part of the equation from the beginning, but it can also be the focal point of a standout outfit. The right pieces can level-up even the most basic outfits. Simple jeans and a tee can suddenly become a look. Fashion girls are already proving that this theory rings true by pairing the season's biggest jewelry trends with outfits on all ends of the spectrum. From the '80s earring trend making a major comeback (the most extra of accessory trends, in the best way) to the seashell trend carrying over from summer, below we're breaking down the six biggest fall jewelry trends we're already seeing all over our most stylish readers. We've also shopped out each trend, you know, in case any or all of these really speak to you. Many '80s trends are making a comeback this fall, but it's specifically the bold, blingy earrings of that time period that have us excited right now. Clearly, we're not the only ones, as our readers have been taking their going-out looks up a notch with these as of late. Pair these beauties with everything from polka dots to a white tee. PSA: Your favorite heart earrings are now a thing again—and no, you haven't grown out of wanting to wear them. Yes to everything going on here. You can keep all your other jewelry simple and let the earrings do the work. They work well for daytime. They work even better for the evening. So you still have your bold gold hoops from seasons past, right? While we're still wearing those on heavy rotation, this fall, fashion girls are branching out to other gold shapes—and the best part is they go with pretty much anything. Gold earrings and slicked-back hair are a match made in heaven. We love that this shape can be worn day or night. A vintage-looking pair is always a good idea. Not to say we told you so, but we saw this one coming a mile away. Chain-link pieces are statement-making enough to be worn alone but also versatile enough to layer with your other favorite delicate gold jewelry. How pretty is this layered look? Also pairs well with gold hoops. Casual enough to be worn during the day. This is what we want to be wearing all day, every day. A gold chain makes everything look sophisticated. Gold chain necklaces aren't the only stars of fall. Fashion girls are adopting statement-making collars of all kinds. Silver collar + leopard = very fall 2018. A little bling never hurt anybody. Is it just me, or does everything about this look feel so directional? 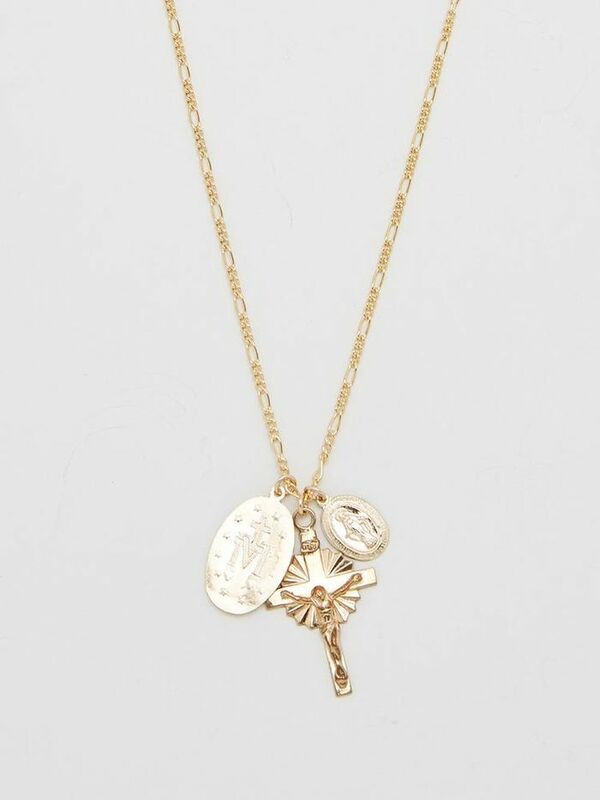 We love the addition of a simple necklace layered with this piece. Summer's most fun jewelry trend is sticking around for fall—and it adds a playful edge to anything you decide to pair it with. Seashells, but make it fashion. The classic shell necklace isn't going anywhere. We love these shell earrings as a fun twist on the trend. Shells are the perfect complement to florals. Okay—how fun is this outfit? Pairing shells with neutrals looks so elevated. Last but not least, the layered gold jewelry look isn't going anywhere, so pile on your favorite delicate necklaces. Utilizing different lengths is definitely the key here. This feels polished yet has so much personality. Two delicate chains are always better than one. Ready to show us your looks? Tag @WhoWhatWear on Instagram and use #WhoWhatWearing for a chance to see them end up here! Oh, and if under-$100 jewels are your thing, we've got the 47 best pieces.